Posted October 21, 2014 by Dan Weisberg & filed under Leadership Rockland Alumni. The race is over, and Mike’s official race time was 3 hours, 59 minutes and 15 seconds (3:59:15). A tremendous effort by Mike, not only in the race, but in putting this entire event together. And the winner is: Tracy Herb! Congratulations with a guess of 3:59:26. At this year’s graduation in June, we will celebrate our 25th anniversary at the Gala. We will celebrate with many of our alumni and rekindle our rich history. We hope to see many alumni at our Gala event. Details will soon follow. In the spirit of our 25th anniversary, one of our alumni, our Selection Committee Chair, Mike Seidenfrau, is “donating” himself and his performance in his first ever marathon as a fundraiser in the form of a 50/50 raffle. The person who guesses closest to Mike’s official finishing time will receive 50 percent of the raffle, while the rest of the proceeds will benefit Leadership Rockland. Please see the details below on how to participate and also view data on Mike’s last 3 HALF Marathon’s, all this year. Each guess is $20, and you may submit more than one guess (at $20 each), and you may donate above your guess entry fee. 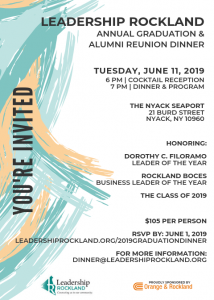 Please help support Leadership Rockland in its missions and participate in this creative fundraiser. The winner will be announced by email and on this page on 11/25.